"I've been lucky my entire life," the founding dean of dance at Miami's New World School of the Arts told members of the National Dance Education Organization last fall, when he accepted their Lifetime Achievement Award. Indeed, moving through career passages, Daniel Lewis often came to the next threshold just down the hall. In 1962, his first year at Juilliard, he joined the dance company of renowned faculty member José Limón. Already Limon's assistant, he began teaching at Juilliard upon graduation and went on to become assistant to dance division director Martha Hill in 1984. “I had a very successful career," he says. “But I was bored." Following a lead from Hill, Lewis visited Miami to interview for a deanship at an arts school that was planned to open in 1986. It was designed after a high-school-to-college model advocated by the late Senator Jack Gordon, who wanted to keep talent in Florida for extended training. When the organizers gave Lewis carte blanche to work out program details, he was hooked. “I've always liked starting things," he says. And in this spirit, Lewis nurtured an unparalleled three-tiered dance program, offering high school, associate of arts and bachelor's degrees in partnership with the Miami-Dade County school system, Miami-Dade College and the University of Florida. Participants can enter NWSA by audition in ninth or 10th grade, or at the freshman or junior year of college. They can earn college credit while in high school to finish their BFA three years after high school graduation. Not only does this provide an economic advantage, it gives students a sustained knowledge of anatomy and movement right from their initial training. “This extends careers," Lewis says. As dean, Lewis encountered challenges along the way. “I walked into a neighborhood where there was ballet and some jazz, but very little modern preparation," he says. While bringing expertise in Limón technique, Lewis was determined to turn out students proficient across a broad spectrum of dance. “Pretty much unheard of at the time," he says. His plan included world dance traditions, with classes in Indian, Afro-Caribbean, and various styles of Spanish and African dance. Lewis has also impressed upon his faculty the need to foster artistic expression in a range of body types. “I've wanted to tear down clichés about what a dancer looks like," he says. Dance teachers at NWSA judiciously champion these goals, and statistics for Lewis' division confirm its success, with a high percentage of graduates populating various domains of dance, including major companies such as Alvin Ailey American Dance Theater. Representatives of other institutions regularly seek his advice and observe classes. Yet, for Lewis, the measure of accomplishment must take in values beyond the honing of peak-level dance skills. “We're not just training toward the perfect arabesque," he says, “but leading students to think creatively." Graduates should illuminate tasks in any field, like their classmates in the arts, with bright individuality. “I'm now on a personal crusade to put dance in every school K through 12," says Lewis, set to retire from his post later this year. NWSA already draws the area's public-school teachers with workshops for professional development. And, throughout the coming months in national speaking and teaching engagements, Lewis will spread his message to engage students in dance at the earliest possible age. He'll also continue to apply emerging technologies to dance and teaching, a long-standing pet project. 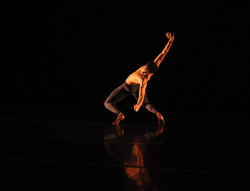 In 2006, for instance, he collaborated with University of Florida's Digital Worlds Institute to produce In Common Space, a triple-location event uniting dancers and audiences in real time across the U.S. He hopes to bring the International Digital Media & Arts Association convention to Miami, further securing for his home base a place in the orbit of artistic and educational innovation.